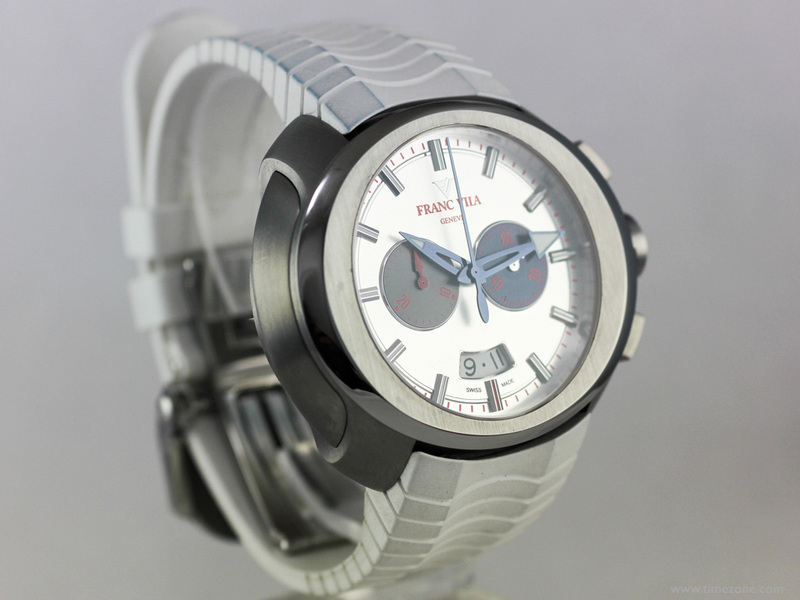 Since it's been five years since I last handled a Franc Vila timepiece, Franc Vila graciously loaned two of its latest timepieces to catch up with its newest suspended skeleton and bicompax chronograph. 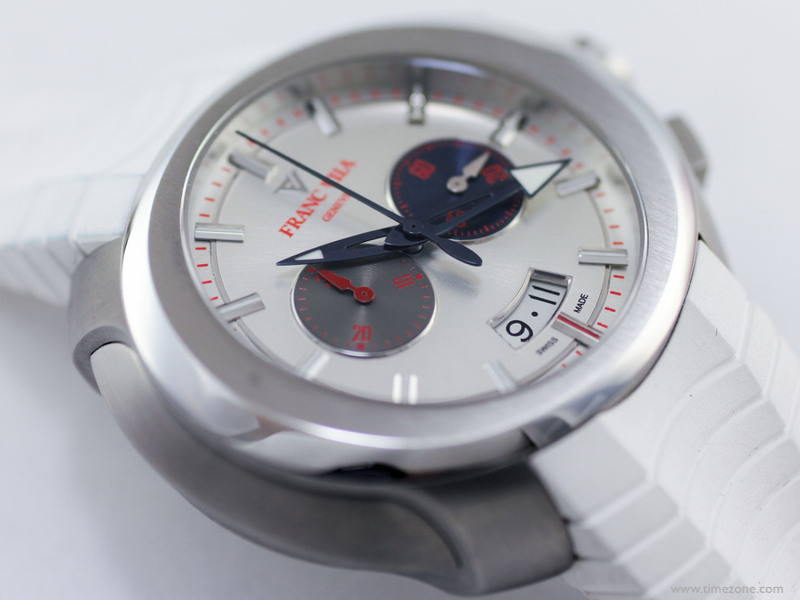 I'll begin this two-part series with the bicompax chronograph, since it introduces an updated case and new dial layout. The FVi17 Vintage Chrono Bicompax Intrepido TiDHES is a bicompax chronograph with an elliptical case, elliptical bezel and a round dial. I'm not entirely sure why the model is called "vintage" since it's an entirely fashion-forward design. Perhaps the bicompax dial layout is a nod to something classical. 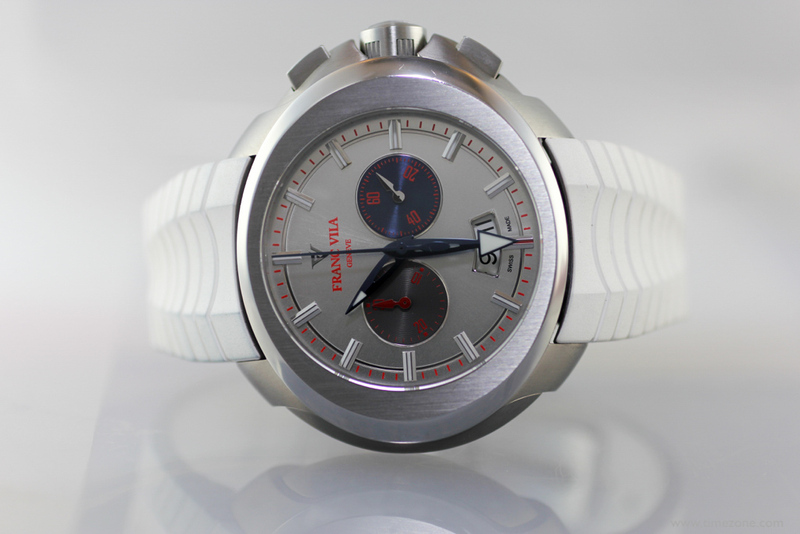 "TiDHES" refers to the unique case and bezel materials and reflects Franc Vila's science background as a biochemist. The case, crown, crown guards and chronograph pushers are made of a special titanium that is structurally reinforced by nanotubes. The titanium composite is 35% less dense that conventional titanium with superior tensile strength. 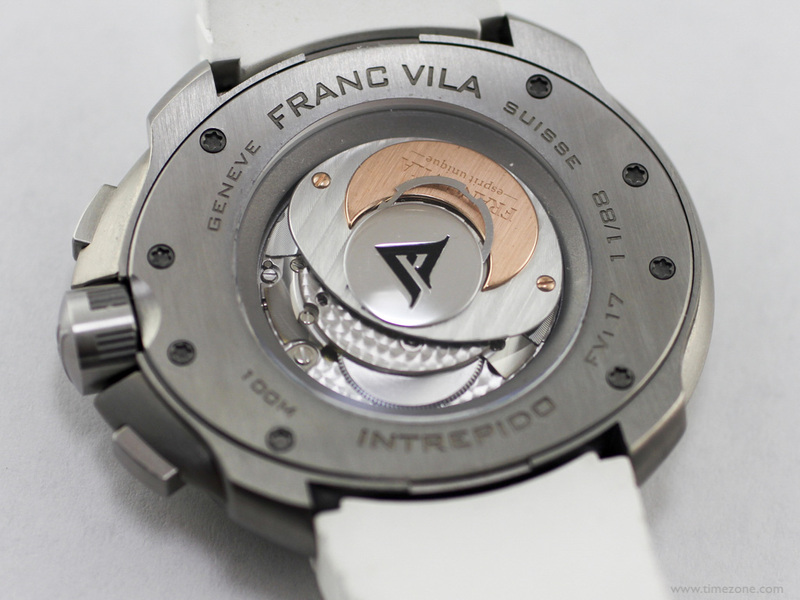 The elliptical case is one of Franc Vila's signature design cues. 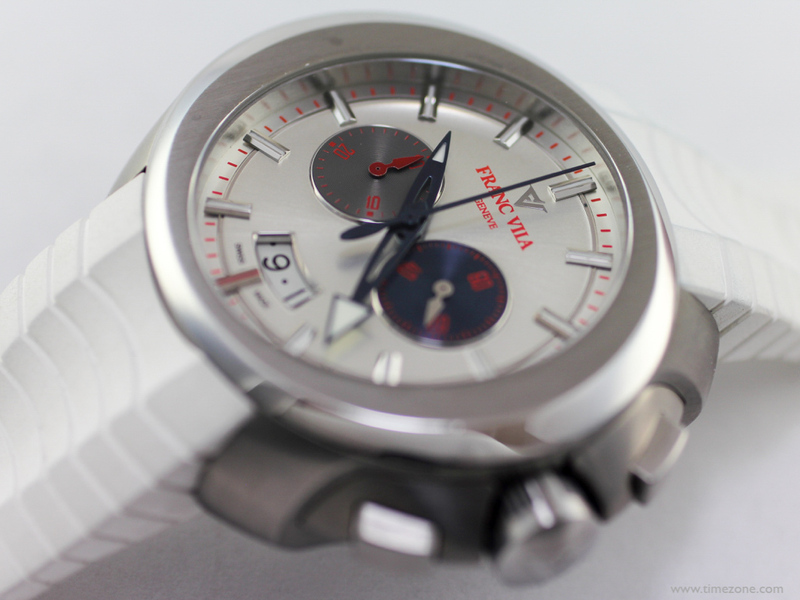 The FVi17 features an oversized elliptical case that measures 42.00 mm x 50.00 mm. Suffice it to say that the FVi17 is very large and substantial on the wrist. The titanium case is finished with brushed surfaces. 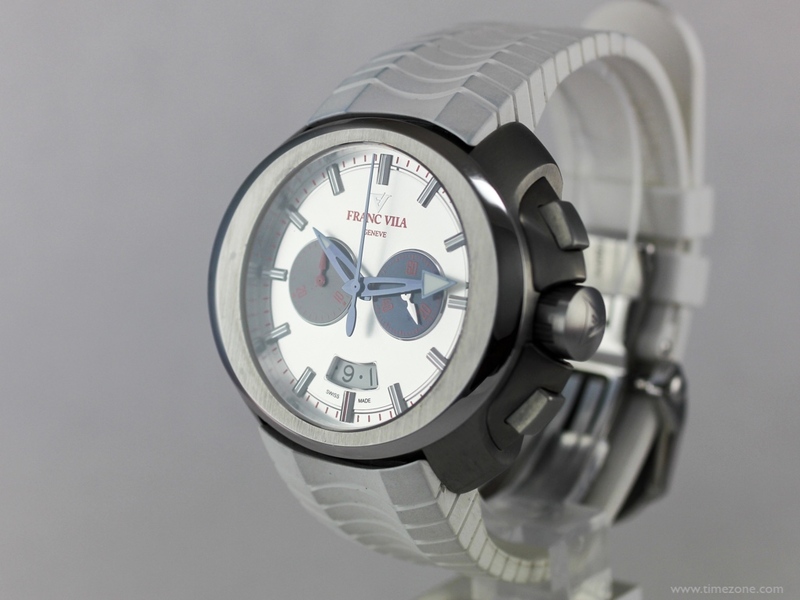 The elliptical bezel is made of the brand's proprietary Die-Hard Extreme Steel. Die-Hard Extreme Steel is a durable steel alloy that is more resistant to scratches and shock than conventional steel, and features both anti-magnetic and hypoallergenic properties. The bezel is finished with brushed top surfaces and polished curved sides. The sapphire crystals on the dial-side and display back are treated with an anti-reflective coating on both sides. The FVi17 is water-resistant to 100 metres. 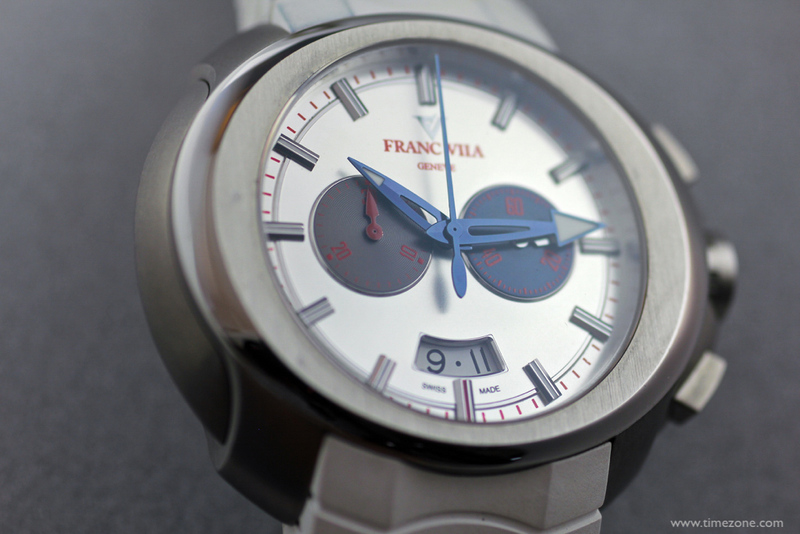 The round, silver dial is finished with a sunburst guilloché. The grey 30-minute counter at 9 o'clock and blue small seconds at 3 o'clock are finished in a radial pattern. The triple date display at 6 o'clock is horizontally positioned. Despite an overall symmetry of the dial, the aesthetic of a circle within an ellipse is a bit more avante-garde than my tastes. But more importantly, the dial is undersized. 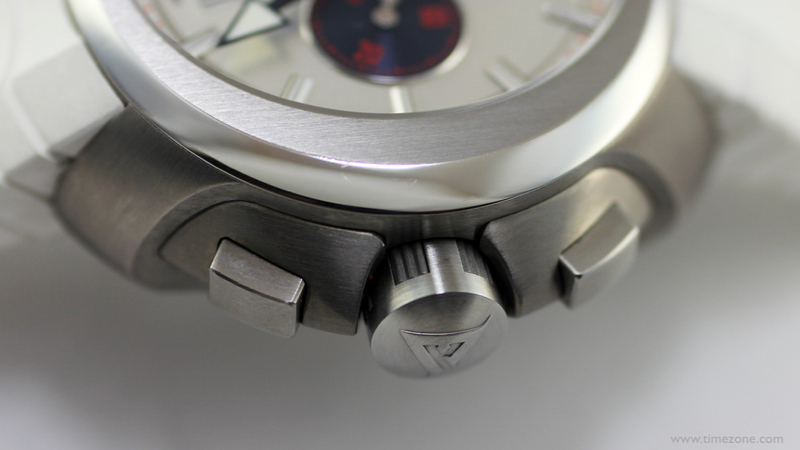 Due to the undersized movement (relative to the case), the registers are necessarily close to the center of the dial. Large applied indexes are used to counterbalance the effect. But understanding how the movement defines the dial design makes it evident that either the dial is undersized or the case is oversized. The blued hands are filled with luminescence and, together with a red minutes scale, lend to the dial's overall legibility. 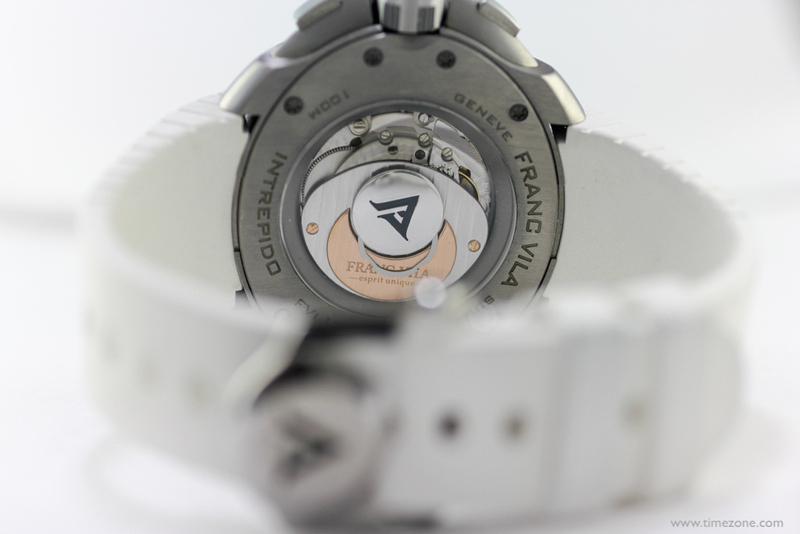 The FVi17 is fitted with a 21-jewel Caliber FV17 automatic chronograph movement. 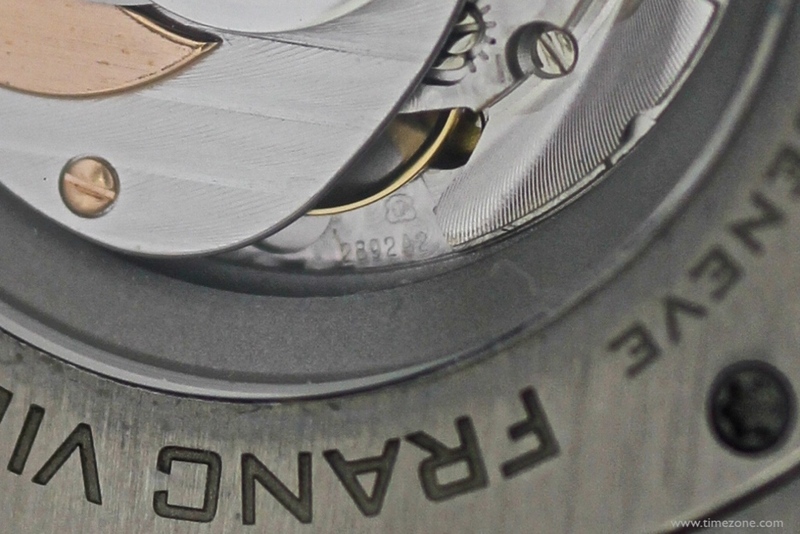 Under a loupe, it is apparent that the movement is hand-finished with perlage and Geneva stripes. On the mainplate, the ebauche is stamped ETA 2892/A2. The ETA 2892/A2 ebauche is a slim 11-1/2" ligne movement that measures 25.60mm in diameter. Notwithstanding, the elliptical case is 50mm at its widest parts. 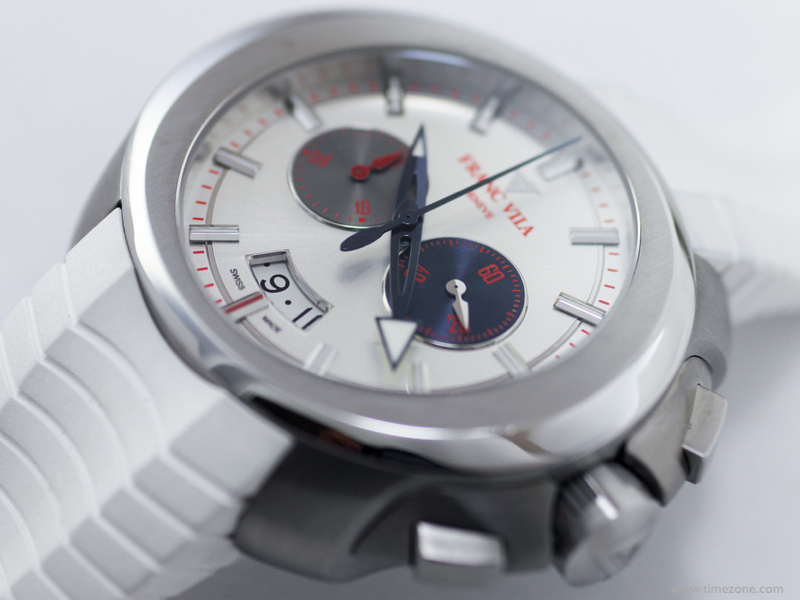 The movement size defines the dial, which in turns defines whether the dial and case are balanced. Since the movement is half the case size, clearly there is an imbalance. The modified ebauche is fitted with a Dubois-Dépraz chronograph module. 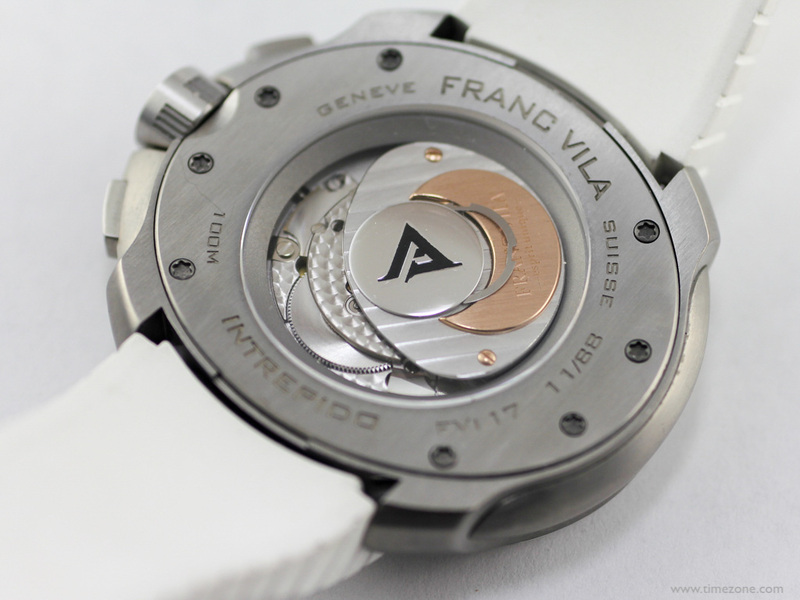 Ever since its founding, Franc Vila has housed Dubois-Dépraz movements and remains loyal to the manufacturer. 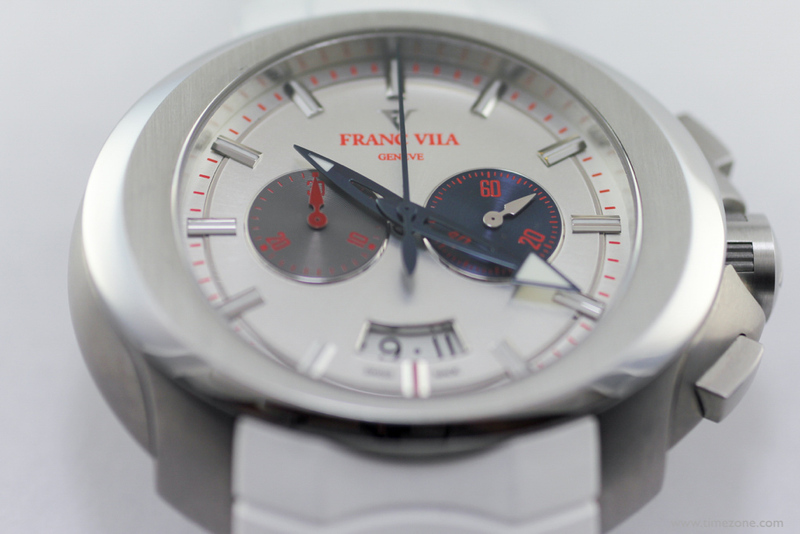 Although FVi17 is not COSC-certified, over the period of one week, the FVi17 performed well within chronometer standards at -2 seconds per day. With its proven track record as a robust and reliable ebauche, I anticipate the timepiece will continue to be reliable and accurate over the long-term. 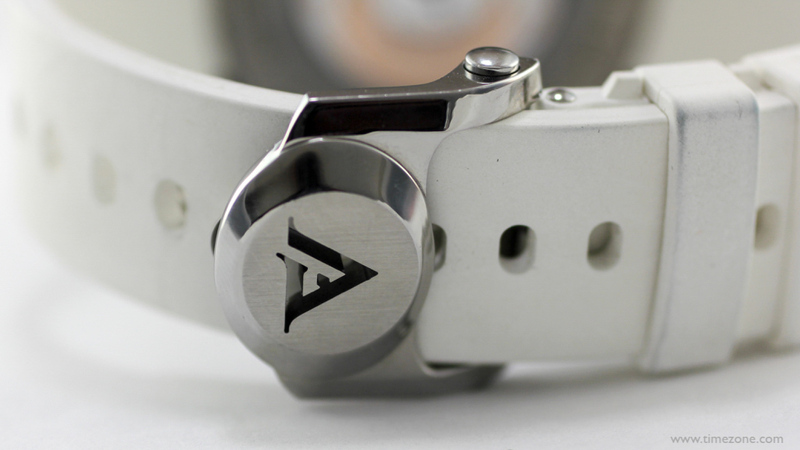 The Caliber FV17 has a large rotor of polished steel and an 18-carat gold medallion decorated with the "FV" logo. 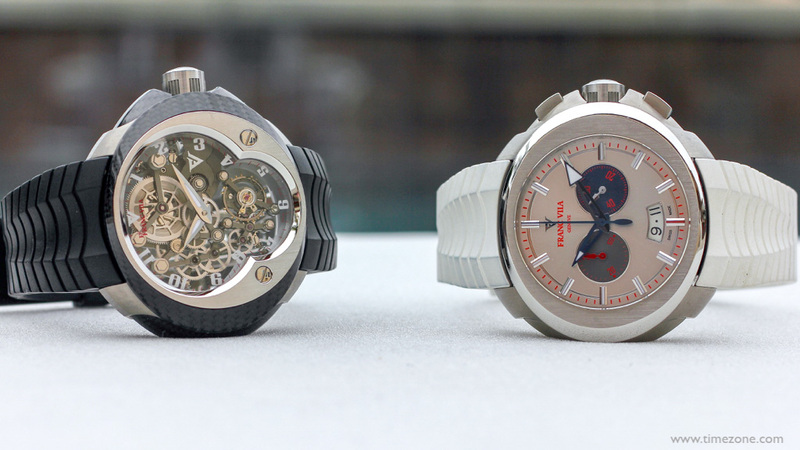 Aesthetically, the large rotor counterbalances the undersized movement. Power reserve is the standard 42-hours. Given the popularity and wide availability of the 2892/A2 in a number of Swiss watches, the retail price of $14,500 is aggressive. 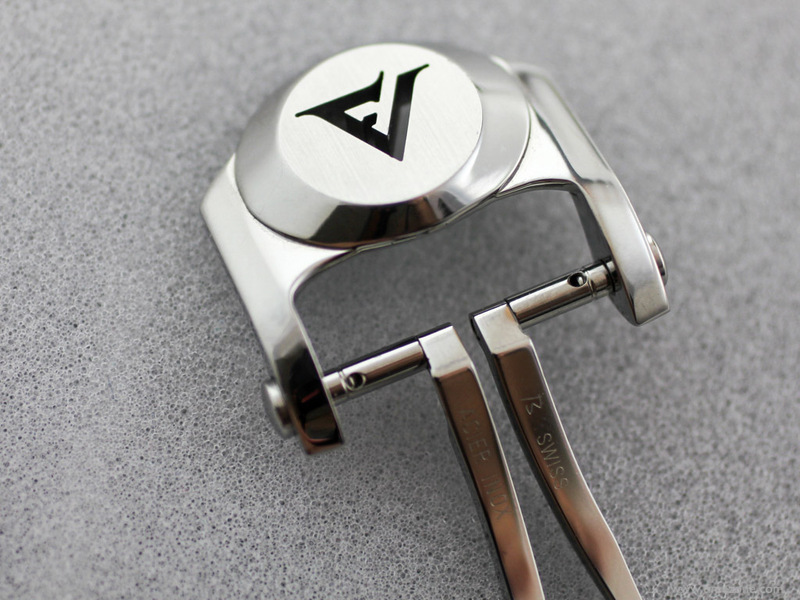 The FVi17 is fitted with a rubber strap and steel deployant clasp. 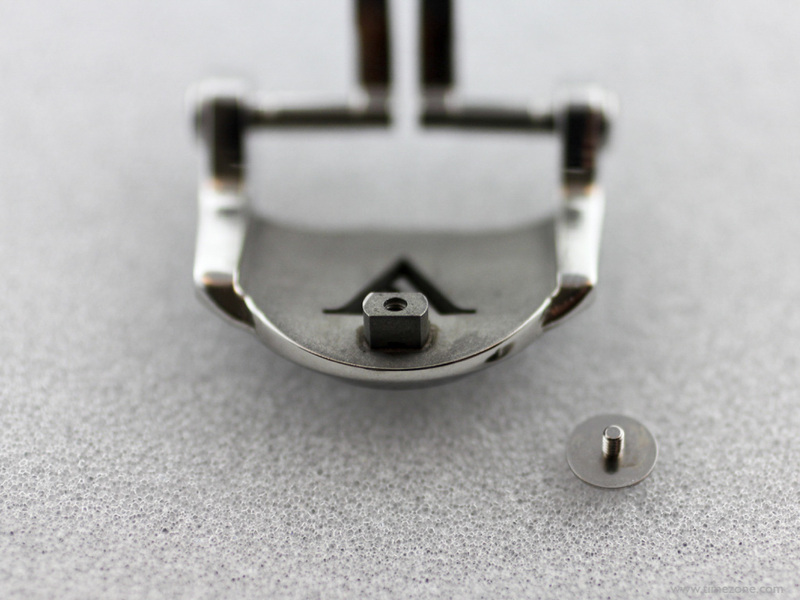 Once the deployant clasp is sized to the correct hole in the strap, a screw secures the clasp. 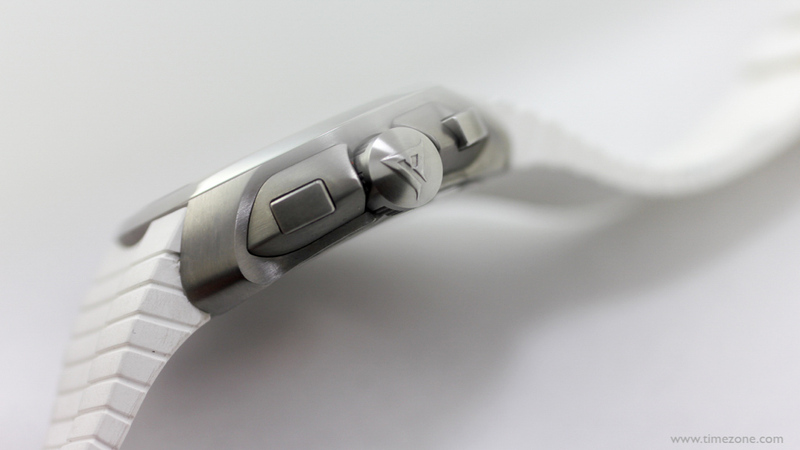 The deployant clasp is nicely finished with the brushed surfaces and polished sides that complement the bezel. I especially like the detailing of the laser cutout of the "FV" logo. 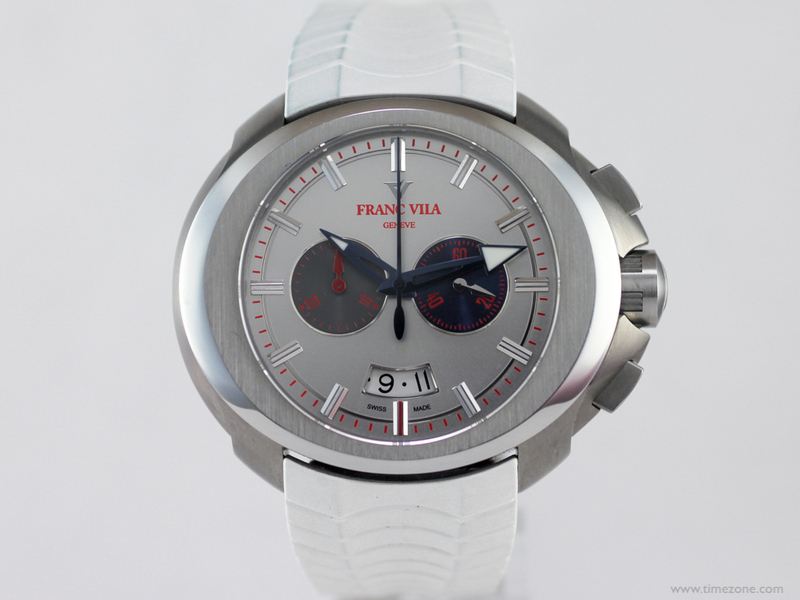 The FVi17 Vintage Chrono Bicompax Intrepido is a limited edition of 88 pieces. Previous Topic: Mike Mike Mike Mike Mike..What day is it Mike...IT'S HUMP DAY...whatcha got?